The World of Arcadia offers opportunities for all adventurers seeking to forge their path and build themselves to rank among the gods. Many caves, dungeons, fortresses and strongholds await those worthy of their riches held within – often protected by fierce creatures and their masters, willing to defend their fortune at all costs. Traverse these lands, explore the dungeons and cleanse the evil within to become a mighty Hero and venture forth unto victory. The many cities and settlements found throughout the world provide refuge to travellers and adventurers across the globe. Often referred to as “Safe Zones”, these areas are considered home to the various different merchants and provide a safe haven for everyone. Powerful wizards have provided each city with a central Portal Stone which can be accessed by anyone. Portal Stones allow instant teleportation to areas discovered by adventurers and are protected by strong magical barriers to ward off incoming threats. Anyone situated within close proximity of any of the city’s Portal Stones will be immune to attacks from others. Bichon Wall was one of the first ever cities to be built, hundreds of years ago. Starting out at nothing more than a small settlement, Bichon Wall has since marked it’s position on the map – evolving into one of the most successful establishments in the whole Arcadian World. The desert civilisation known as ‘Mudwall’ resides within the Mongchon Province, north of the Bichon Province. Built purely from the abundant mud and clay deposits, the towns walls provide strong fortification against potential invaders. 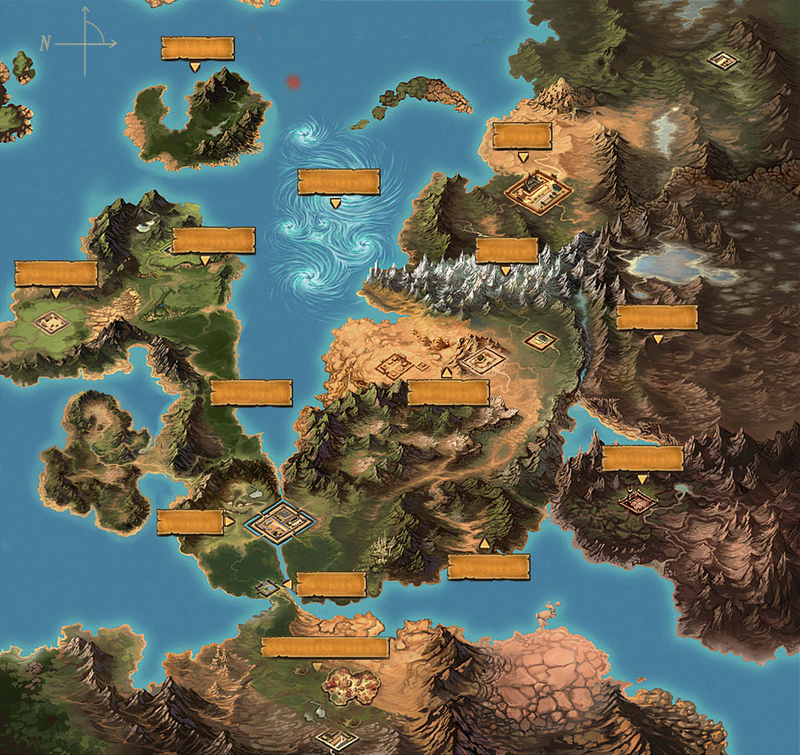 Many adventurers set sail to the vast open sea, soon discovering a mysterious island East of Prajna Island. Abundant with wildlife and stunning scenery, this peaceful island soon became a very popular fishing village and go-to place for adventurers. One of the very first castles to be constructed, Castle Gi-Ryoong is the oldest standing castle still functional to this day. Surrounded by high cliffs and mountains, this impenetrable fortress remains untouched to the harsh elements and invaders. During the great Oma Invasion, what we now know as Bichon Wall was nothing more than a small fortress against the menacing Oma presence. Over the years, the land has begun to take shape, and with the Oma threat now reduced, civilization thrives and conquers. Deep within the Woomyon Woods, you will find the famous Taoist Academy. Many great Taoists were trained in the art of spiritual enlightenment by some of the strongest individuals on the planet. Even today, many aspiring young Taoists will pass through here. Just of the coast of Bichon Wall, Prajna Island stands as one of the most dangerous places on the planet, housing some of the world’s most fierce enemies. Adventurers can catch the ferry from Bichon Wall to the local fishing village anytime, for a fee. The Arcane Fortress, now known as “Arcane Wall” is home to some of the strongest wizards in the world. The Arcane Palace is often contested by local guilds, fighting for ownership. Protected by strong magical wards, this fortress is a highly desired piece of property. The Phoenix Oasis stands as the middle ground between both King Leoric’s desolate chambers, and Queen Leoric’s Halls of Agony. A small trading post has been setup by travelling merchants who offer specialist services to aspiring adventurers looking to upgrade their equipment. North of the Phoenix Oasis, you can find the heavily fortified Phoenix Castle. Many guilds gather here, contesting for control of the land. The towering walls and central location provide strong defense against potential invaders. This stunning corner of paradise offers respite to worthy Heroes, located East of Castle Gi-Ryoong and protected by strong magical wards only the Three Heroes can pass through unharmed. Occupied only by a handful of selected merchants, these experts offer specialist repair services. During the Dark Exile, the Horadrim Order managed to slay Diablo and trap him within one of three Soulstones. The Order began to dissipate as their numbers dwindled, and the monastery fell into ruin. Over time, villages were established in the surrounding area. The Vailutra Forest is home to some of the most fascinating beasts and wildlife on the planet. While their captivating appearance may fool you, their deadly claws and debilitating poison can quickly dispatch any who enter their territory. The goatman clans are said to occupy this region. Snowbrook Province, conveniently named after its’ harsh winter cold and snowy weather all year round, is home to a series of ferocious beasts and a superior race of Svaltus warriors who reside within the Crystaline passage. The ancient temples stand tall and can be seen in the distance. The arid remains of a once thriving civilization, now but a shadow of it’s former self, Naga Wall is the last remaining city in the barren wasteland that is the Naga Desert. Occupied by aerial scavengers and goatmen clans, the desert is no place for young adventurers. Acting as a halfway point between Naga Wall and the Naga Fortress, in the center of the Naga Desert, traders have setup camp and can be found selling small goods such as health potions, and trading local ingredients to experienced adventurers travelling through. North East of the Vailutra Forest you will find the Ayarin Province. The beautiful Ayarin village is usually the first stop for adventurers looking to uncover the secrets of the Temple of the Cursed Jungle. Mysterious creatures lurk within it’s depths, ever weary of greedy travelers. Rotting corpses, bile demons, undead soldiers and many more unthinkable horrors roam freely on this cursed island. Appropriately named “Isle of the Dead”, is where only the strongest of adventurers dare to explore, in hopes of discovering the lost secrets of the Tomb.